Symaga takes stock of 2018 with an increasing number of important projects in its portfolio, ensuring a growing turnover and references list for the next few years after becoming the a global key supplier of silos for the major storage projects worldwide last year. These projects include the new storage terminal and extrusion of soybeans plant in the Algerian port of Djen Djen, with a capacity of 240,000tons and a scope of 12 silos of 32 meters in diameter, among the largest in the world made of steel, plus other storage solutions to complete the needs of this will-be leading plant in the sector. This soybean oil extraction plant within a port facility joins Symaga's list of references in logistics terminals, a strategic development path for Symaga. With capacity to process 1.6 million tons per year, this plant and terminal built in Algeria becomes one of the most important port structures in the Mediterranean. Logistics and safe storage play a key role in food safety strategies. Symaga storage solutions have been chosen by the Sudanese government to uphold access to food in the African country through a grain storage project with 300,000 tons of capacity. The project is divided into two plants with more than 90 silos in Barakat city, on the coast of the Blue Nile, and in Manaqil city, in the state of Al Jazirah. This project has been developed together with their client 5S Makine. In 2018 Symaga has also deepened its trade links with new commercial destinations. Asia is a key area for Symaga's strategy thanks to the growing demand for storage that is expected in the coming years. After penetrating the market five years ago with a more aggressive commercial policy, to the list of references, which already include the first bulk port terminal in Indonesia and facilities in Korea, Malaysia, Philippines and Vietnam, in 2018 there are three new projects in Myanmar: Kirim's new brewery, with 9 920 / 11T45 silos and 2 610 / 11T60 silos; a new logistics terminal of 55,000 m3 with 13 flat bottom silos of 15m diameter and 3 discharge silos of 4.6 m in diameter; and a wheat storage plant for the new mill currently under construction by one of the leading global food groups. The list of references in the American continent is also on the uptick. 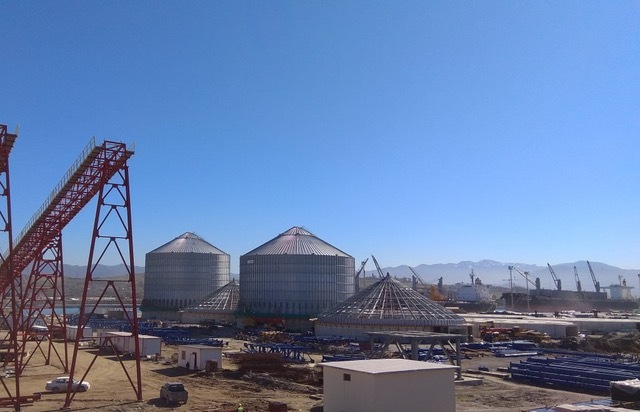 Grupo Modelo, a leader in the production, distribution and sale of beer in Mexico, with exports in more than 180 countries, has relied on Symaga for its new plants in Zacatecas and Puebla, with a total of 22 hopper silos and a capacity of more than 27,000 m3. Also in Mexico, a new bioethanol plant of 27,000m3 capacity has been supplied. In the Panamanian city of David Symaga has signed a new rice plant with a capacity of 38,500m3, distributed in 13 silos designed to improve the conservation of rice, with fully perforated aeration floor and double walls, to increase thermal insulation. In Uruguay, 10 hopper silos with 10.70m diameter are being assembled for Maltería Oriental, one of the main malting plants in the country, with 80 years of experience in the production and commercialisation of malt. The plant has a privileged location on the outskirts of the city of Montevideo, a few minutes from the port, and a few kilometres from its barley crops. With these projects, 2018 affirms Symaga Silos as a leader in the manufacturing of industrial silos for the largest storage projects in the world. Its manufacturing capacity, its technological commitment and coordination and technical excellence provide the perfect basis for the Symaga team to guarantee the development of large facilities. For more information visit the Symaga website, HERE.